It’s that time of year, when the birds of winter settle in and establish their territories at the feeders in my yard. This morning, I restocked the feeders and watched as the Chickadees, White-Breasted Nuthatches, Tufted Titmouses and Cardinals spent their day eating and preparing for the upcoming winter. I particularly enjoy observing the Chickadees, who also cache their sunflower seeds in various trees around the yard and guard them as best they can from the hovering squirrels. During an afternoon break, Peppermint and I took a walk around the yard taking in the warmer temperatures and clear blue sky. The honking of a large flock of geese, flying south along the ridge line, caught my attention. 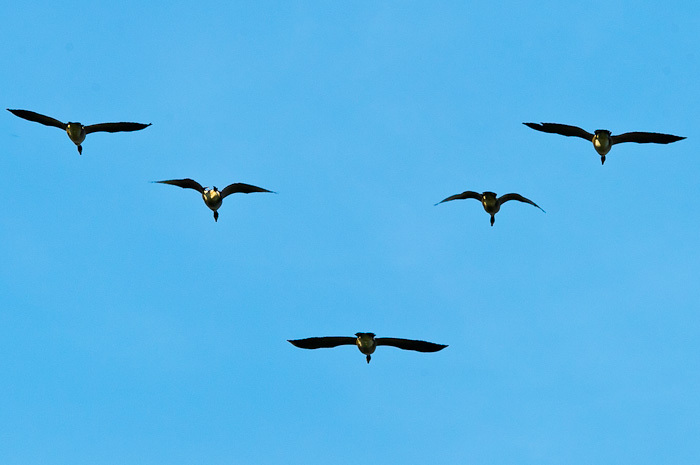 I counted 36 as they flew over my head. Although I sometimes wish I could fly south for the winter, too, I’ve grown to enjoy the change of seasons and the different visitors who call my yard home during the coldest months of the year.